Book Reviewer and devoted lover of all things romance: YA, NA, Paranormal, Urban Fantasy, Horror, Dystopia and more. This is a really hard review for me to write, I’ve been reading this series since the beginning and never really wanted it to end. But no it is the end and I have to say good-bye to two of my favorite characters. As a huge X-Files fan this series brought back memories and it was like reading new episodes of Mulder and Scully, but with much more sass and chemistry. Oh and if you haven’t read this series, you must read them all before this one. Alright…so now on to my review! 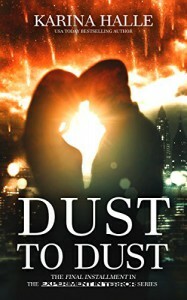 Dust to Dust follows Perry and Dex in their final Experiment in Terror. Leaving off from the end of Ashes to Ashes, Perry has come face to face with Michael, Dexs’ brother who is actually the evil that has been waiting for the moment to finally get what he wants. Dex has to take on his past, while also protecting Perry and her family. Perry is trying her best to protect Dex and will go to great length of crossing through the Thin Veil to stop this malevolent evil. But Michael isn’t the kind of evil they have faced before and it might just be their last. Perry has always been the tougher one of the duo, the one who has her eyes open the most and run head on into danger for her loved ones. 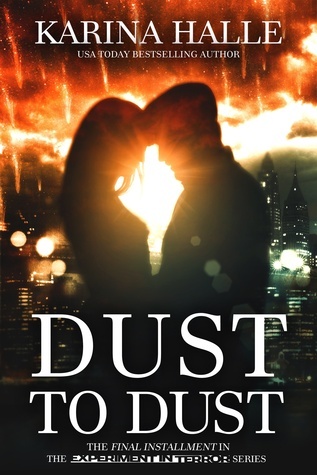 In Dust to Dust she is faced with the challenge of holding on to Dex, but also bonding with her sister and mother with the fact that their bloodline is something special. What I loved most about Perry in this book is how much she has grown with her family, the struggles they have had, and the arguments and betrayals have all led up to this. Both daughters and mother have to confront and fight the very fear that can destroy them all. Then there is Perry with Dex, these two are so freaking awesome together I can’t even describe it. From the minute they meet at the Lighthouse to this end where they walk into Dexs’ childhood home, they are together and are meant to be together. Dex has to confront everything he didn’t want to remember from his childhood, his brother is not his brother anymore but something that wants to use him. Most of this book Dex was confused and well… other things that I don’t want to give away. But most importantly he needed and only cared about Perry. She was his one constant and always the one person whom he felt could grounded him. Oh and I cant forget, the readers will love Dexs’ POV!! In the end, the whole gang is back, Ada, Perry’s sister gets a lot of page time and helps her sister deal with the thin veil. Their mother surprised me the most and seriously made me cry like a damn baby because well so much happens and she seriously changed my mind about her. Then there is the ginger, Maximus, who may have frustrated a lot of people through out the series but hell… he does a massive kicker in this one that I know fans will be talking about for a while. Pretty much every character was important, seriously a huge piece of the big puzzle that was the evil surrounding Dex and Perry. Lots of things from Dexs’ past are brought out and WOW, do they have to be ready for a head on attack. Overall this was the best of the best in the series and that’s saying something, because I loved every one of these books. Halle wrote two characters that are not only unforgettable, but can easily connect to because they are just that awesome. This series is scary and will have you not wanting the lights to go out, but its also about two people that would go through hell and back for each other and that just rocks. I will never forget Dex, Perry, Max, and Ada as well as fat rabbit. The series started with a bang and ended with one. I applaud Halle for one hell of a series. Thank you! This is a mature adult novel, with sexual content and very scary moments. I highly recommend this to fans of Stephen King, who like some really great twists with mystery and intensely shocking moments.